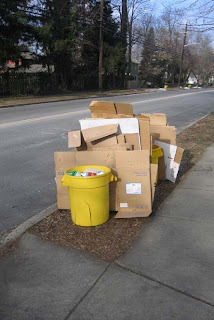 It's a new morning in Princeton, as recyclables wait expectantly at the curb for their first commingling experience. Mercer County, which runs curbside recycling for the township and borough, has just switched to single stream recycling. This means that all recyclables will be tossed in the same truck. Improvements in sorting technology at recycling plants makes it possible to reduce the number of trucks coming by your house from two down to one. According to a Dec. 31 article in the Princeton Packet, this streamlining of recycling pickups is expected to save $53,000 for the borough and $176,000 for the township over the next three years. The article says the savings come from "fewer trucks, reduced manpower, fewer personal and other things like required maintenance on the vehicles." Most important for the future of the planet will be a reduction in fossil fuel use.